Metal detecting for bigger nuggets requires a lot of skill and patience. You cannot just wake up one day and go. You need to research profoundly and sharpen your treasure hunting skills. Using metal detectors to find gold nuggets means that you are going straight for the big stuff. Therefore, you cannot go gold hunting in places known for small flakes; the detector will not be of much help. Look for areas that have a history of hiding bigger nuggets for increased chances of success. Take a look at the biggest gold nuggets that were found using metal detectors. Imagine this; you and your friends go out to hunt for gold with your metal detector and a small tractor, hoping to find “something.” All of a sudden, the detector goes wild and right there, you come across a huge, rare gold nugget. That is what happened to the three prospectors who found the Ausrox nugget. They stumbled upon the Ausrox in Kalgoorlie, popular goldfields in Western Australia. The three lucky guys probably never expected to find such a treasure during their hunt. The Ausrox nugget currently ranks as the third largest gold nugget to ever exist. It is irregular in shape and roughly the size of a basketball and weighs 23.27 kilos (51.25 pounds). The bullion value of the Ausrox is exceptionally high—this coupled with its rarity and size make very expensive in the collector market. The piece itself is quite magnificent; it will have you staring awe and admiration. 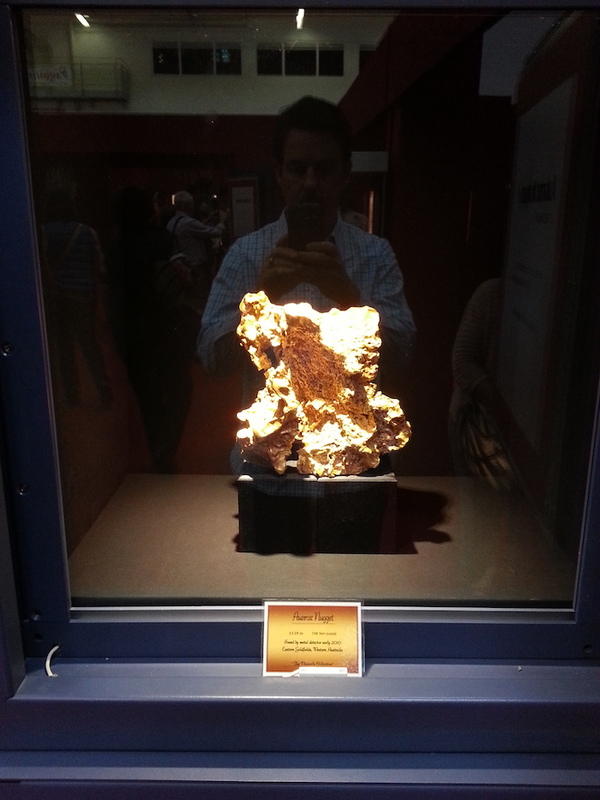 The nugget is being housed at the Houston Museum of Natural Science. It is not every day that a prospector comes upon a gold nugget, big or small, and this may be discouraging to amateur prospectors. However, the finding of the Butte nugget is an encouraging and motivational story; it reminds you that you too can find your nugget. The Butte gold nugget was discovered by a prospector who prefers to remain anonymous, 12” below the surface using a metal detector. It weighs about 75 troy ounces. The exact location of its discovery is undisclosed, but it is somewhere in the foothills in Butte County. Van Camp, commonly known as “Digger Bob” is the one who shares this story. At first, the prospector though it was trash. Because it had a powerful signal, he thought to dig it up so it would not mask real gold. Well, it turns out the “trash” was a huge gold nugget worth $400,000. The Mojave nugget gets its name from the Mojave Desert, in the Stringer Mining District in California, where it was discovered. It was found by Ty Paulsen in 1977. The nugget weighs an incredible 156 troy ounces and many people argue that it is the largest gold nugget ever found in California. This is hardly true as the largest nugget from California weighed 648 troy ounces. The Mojave nugget was sold to Margie and Robert E. Petersen, who later gave it as a donation to the Natural History Museum of Los Angeles County. The Boot of Cortex boasts of being the largest gold nugget in the western hemisphere. It gets its name from its shape—it looks like a boot. This outstanding piece weighs a whole 389.4 troy ounces. Many big nuggets were found very early in history, so it is impressive that the Boot of Cortez was found in 1989. The narrative goes that; a certain man from Senora, Mexico, bought a cheap metal detector and set out to hunt for treasure. It took him a while, most of the time only finding nails and other metallic trash. Then one day, the signal sounded a little different. That is when he unearthed the Boot of Cortez. The nugget has been to various museums and it is a sight to behold. For many experts, it is probably the purest and most attractive existing nugget. The hand of Faith is the largest existing gold nugget today. This piece of fine gold and breathtaking beauty was found by Kevin Hillier in 1980 in Wedderburn, Victoria, Australia. The nugget weighs 875 troy ounces and it was resting only 12” below the surface. The area is known for producing very large nuggets, including the largest nugget in history, the Welcome Stranger. Hillier sold the nugget for well over a million dollars to the Golden Nugget Casino Chain. It is available for public viewing at the Golden Nugget, Biloxi, Mississippi. Using metal detectors to find gold nuggets may seem cumbersome—it actually is—but just like the above-mentioned prospectors, you never know when lady luck will knock on your door. One day, you may unearth something as big and contribute to the world’s history.